Entering “Invisible Phone Repair” feels oddly familiar… and not in a good way. From the cheeky slogan “Tired of having a working phone? We’ve got you covered” that’s plastered on the shop’s sign to the boxes of “born to die” off-brand chargers, the entry to InVisible NY looks just like an average phone shop -- but one that calls out all its shortcomings. (Less-than-helpful store associates included.) From there, you’re ushered into a world of “upside down”: a subway platform from the late ‘80s, an office from the same era, and your grandmother’s living room -- but all literally upside down. In each room, you can interact with pay phones that only connect to an automated customer service rep, or play an old school video game on a barely functioning TV. The thinking behind these spaces, according to Visible, is to take the old experience with phone companies and literally flip it on its head -- as well as provide some pretty interesting backdrops for your Instagram. 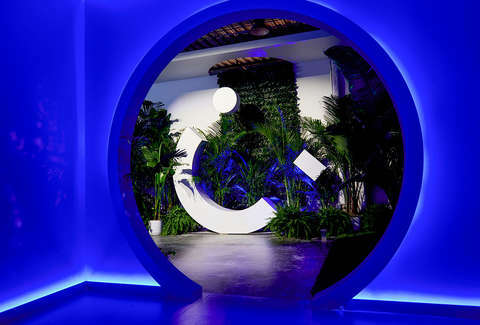 A series of two additional exhibits (including a zen garden made out of phones, aka the “Escape To Clarity” room) takes you to the Garden of Visible -- a bar and event space where you can reflect on all the ways your cell provider has done you wrong in peace. 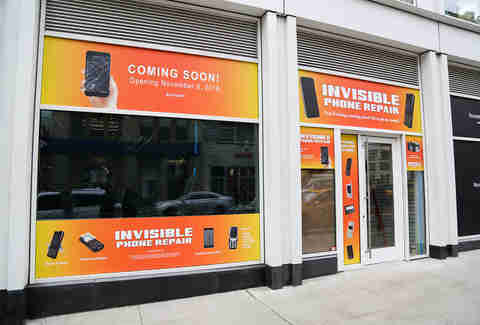 So why would Visible, a phone carrier that operates solely online, open up the worst phone repair shop in all of NYC? Well, to prove a point. Duh. Simply, the way we not only buy, but manage, our cell phones and service plans is a pretty antiquated process when you see how far tech has come since the days of the flip phone. And it’s one that’s ripe for disruption, which is exactly what Visible wants to do. 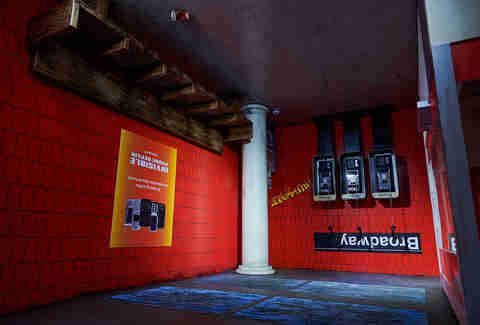 Earlier this year, Visible teased its launch in a similar way, but instead of interactive installations, they created “404 Stores” -- bright blue storefronts that weren’t even stores at all, just canvases for the message: “404 Store Not Found.” (It’s a play on the internet “404” error code that pops up when you’ve incorrectly typed in a web address.) The storefronts also had the message: “Sorry. The phone store you’re looking for can no longer be found. Instead, we’ve packed up everything that you can do here and placed it conveniently on your… wait for it... phone. Phone service in an app. Go figure.” Simple idea? Sure. But it’s one that hasn’t been done yet. Once we found our way into the Garden of Visible, we had some serious questions for our current cell providers. For one, why was the contract so complicated? Why are we still counting up minutes or texts or data usage? Wouldn’t it be simpler to nix the numbers? (And to do that without having to forgo our weekly dumpling orders or happy hour drinks?) In addition to the mobile-focused interface, Visible offers an extremely simple data plan: unlimited data, text, and calls for just $40 a month -- all in, with no hidden fees. And, unlike some other inexpensive carriers, you’ll still have prime service in NYC, as Visible operates on Verizon’s 4G LTE towers. That’s it. There’s literally no other phone plans to consider. Plus, you’ll bring the phone you want to use, keep your number, and get a glimpse at the future of phone service. If you do need to talk to someone on customer service, you’ll hit up their text, chat, or social (because no one wants to wait on the phone these days) and still get a real person. Last, you can pay your phone bill with Venmo. So that random money you have sitting in there will finally be put to good use, rather than just squaring up with your friends. Still skeptical? Well, the pop-up store in SoHo is open through November 25, so stop by… maybe you’ll find some clarity of your own while you’re there.